Downsizing is one of the most notable trends in real estate in recent years. Families both large and small have found a new freedom in living in spaces that are smaller, less expensive and require less upkeep. Storage can be a problem, but it isn’t insuperable. Whatever your reason for living in a small home environment, you can make it work by following a few strategies aimed at helping you make the most of the available square footage. Just remember that decluttering is the cardinal rule of compact living. Most of us live amid objects we could live without. Some are possessions that have some sentimental value, and others might be things (like junk mail and loose papers) that accumulate so quickly we don’t even notice them. It’s essential to keep the clutter under control by purging as often as necessary. Start a system of organization that guides your approach to decluttering and home organization. Make files for essential papers so they don’t stack up and get lost in the shuffle. Don’t be afraid to get rid of old invoices, credit card statements and loan offers, but be careful to shred anything with sensitive personal information. Purging consistently and indiscriminately is essential if you’re going to make living in a small space work. Don’t forget that you need to cover every square foot in your home, including the garage and basement, to stay organized. It’s easy to overlook your closet space. Closets tend to become dumping points for anything you don’t know what to do with but are hesitant to throw out. It’s important to break that habit, because closets are very important storage spaces when your home is on the small side. Purge any clothes that don’t fit well and keep seasonal clothing in storage. Use storage systems for shoes and any folded clothing that doesn’t fit in your drawers. Fit your children’s closets with bins for toys, books, CDs and anything else that could create a clutter problem in the closet. If you live in a small home, you’re probably accustomed to turning rooms into multi-use spaces. 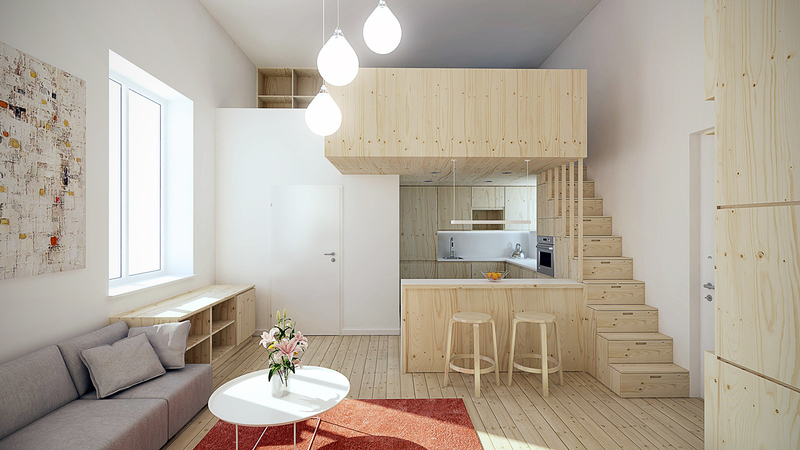 It’s a smart use of square footage and often necessary to make compact living work. Your main living room can be “divided” into a den and a dining room with a couch or rectangular table separating the two. Set up your dinner table and chairs in one half, and your TV, stereo, gaming system and any other entertainment equipment in the other half of the room. It may be less than ideal, especially if you have kids who love to roughhouse indoors. On the plus side, this kind of layout places an emphasis on family togetherness. Unfortunately, decluttering can’t solve all your problems. Sometimes, it’s necessary to get a little creative. A toddler’s bedroom may need to double as a home office, a space for your home computer, printer and any other equipment. A downstairs closet in or near the entryway might need to double as a food pantry, which can easily be done with an intelligent use of compact plastic shelving or built-in shelving. One of the worst things you can do in a tight living space is to try living with loose objects taking up valuable floor space. Plastic bins can help you get organized and maintain flow through your home by keeping those floors clear. 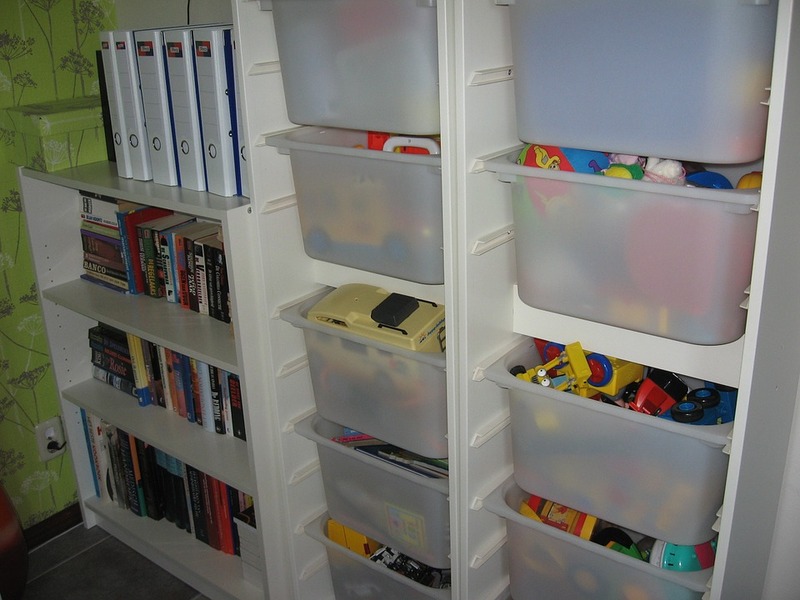 Plastic bins are ideal for storing toys both downstairs and in bedroom closets. Many people use them to store extra shoes, boots, hats and coats they don’t want to give away or throw out. Remember, purging is the single-most important thing you can do to keep a small living space comfortable, orderly and serene. Living among clutter makes it very difficult to stay organized and keep the entire family happy if you lack square footage, so be objective about your belongings and declutter as much as you can. Get furniture that can double for storage. Be careful with shelving. Sometimes it can make a space smaller. It really forces you to look at what you have! If you never blend, don’t have a blender. When I first moved back to LA five years ago, I didn’t have a desk. I had a table to put my laptop on and I had enough room to write on. I needed a place to put other papers on and files and such. I had some TV trays and decided to use them. My thought in the beginning is that they would be a temporary solution. A YEAR later, my trays were overflowing with “stuff”! This is something I also see in my practice. 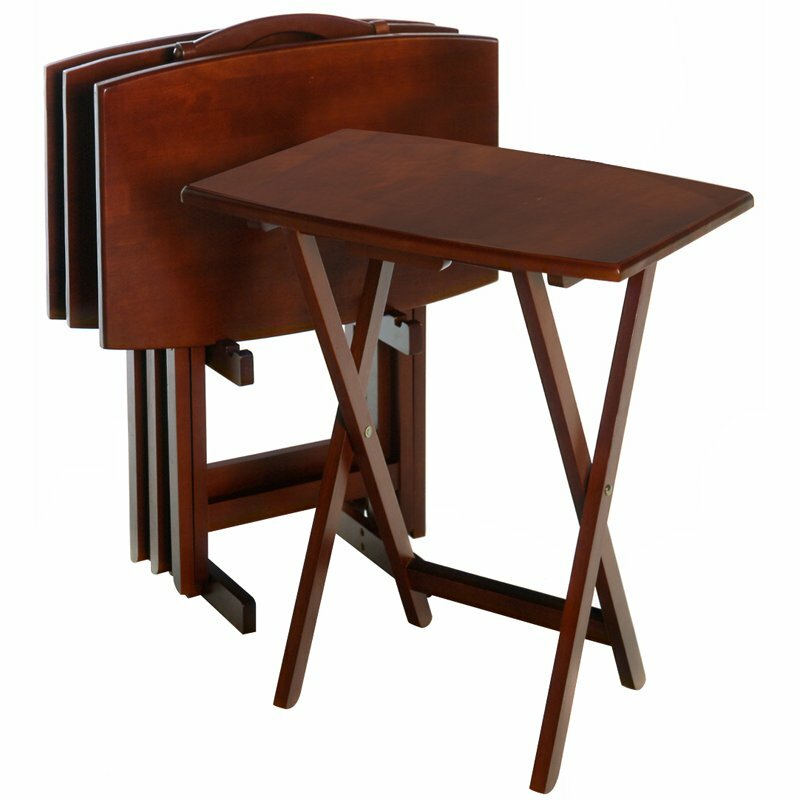 TV Trays, small tables, dining room tables, and counters are open to clutter and collection of stuff! They seem like good ideas for space to place things but they are dangerous areas.I found it easy to just put papers and whatnot on these trays and take my time in finding proper homes for them. Also there is the illusion that since they are small spaces that the clutter can’t really happen. Obviously that’s not true. You can clutter ANY space. Another feature of TV Trays are that they are movable.I found myself moving the full trays out-of-the-way and forgetting about them. No bueno (not good). Out of sight, out of mind. I think I even bought more TV trays and brought them in . Why didn’t I just buy a desk and drawers for files? (I finally did.) The lessons I learned were: Clutter happens easier on smaller spaces; Buy what you need to store stuff as soon as you can; and you should only use TV trays to eat on and put them away after you’re done.